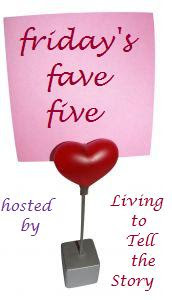 In case you missed the memo, Susanne over at Living to Tell the Story holds this weekly meme in which we are encouraged to list five things that we are especially grateful for, or were amused by, or generally feel blessed with over the course of the past week. 2. Sometimes God's answer to our prayers is: Wait. 3. Just because we're waiting, does not mean that we have to live without hope. I was listening to this song in the car the other day and Bookworm asked me if Spring was literally coming. I answered in the affirmative to him - explaining that winter would last a little while longer but then spring would indeed be coming. I answered him and myself at the same time. "YES - Spring IS coming!!!" 4. Still, we keep praying, watching and waiting, comforted in the fact that God does move, in His perfect time, and that He can handle infinitely more than I'm usually willing to admit. P.S. On a totally different note, I'm also happy to be hosting a few Valentine's Giveaways this weekend. I have the complete Anne of Green Gables set to offer to someone, as well as some YA novels and, lastly, a Five-Minute Devotions for Children book if you'd like to check those out. HAPPY VALENTINE'S DAY! Ecclesiastes (not sure if I still got the spelling right, it's been awhile I haven't opened a Bible :( seriously) 7:10 - I am amazed that there's a text like that. I haven't asked the question though but I always hear that everywhere from people. Thanks for posting that. Your valentine giveaway sounds amazing. If I told my friend about it, she'd surely drool :) Have a great weekend! I will be back...something is wrong with my computer and I can't view any video type things! Oh Giveaways yippeee! such great songs by Steven Curtis Chapman. This post was very timely for me. Thanks for the encouraging words and songs. Steven Curtis Chapman songs are ones I am listening to more and more lately. Glad you had such an awesome week! And spring IS coming -- hallelujah! Sorry! I messed up my previous comment! This was a terrific post. I'm glad you had an awesome week! It's good to see you had a great week. And yes, yes yes, Spring IS coming, I'm counting the days here as well! There is a lot of depth in those songs, so glad they have been encouraging to you this week. Aww...that's a great way to face a new week -- Grinning with hope! A timely and important and true post. Thanks for sharing! Steven Curtis Chapman is surely one of the champions of the faith for his ability to communicate glorious Biblical truth through music. Thanks for sharing a great post. Thanks for stopping by and leaving a comment. Our power outage had some great fun moments, like Sadir (our boxer) and my husband. I thought it was the funniest thing when I woke up and saw trying to crawl up in the chair with him. The picture still makes me laugh out loud. Have a wonderful Valentine's Day. Blessings.